There was a good entry of sheep at Raphoe Mart on Monday, March 25 with an increased number of ewes with lambs at foot on offer. The trade was excellent overall. Fat ewes sold from €60 to €130. Ewes with 1 lamb sold from €140 to €190. Ewes with 2 lambs sold from €200 to €272. 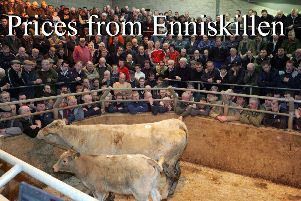 Cattle sale, Thursday, March 28, 2019: Beef bullocks - €590 to €870 over. Store bullocks - €350 to €880 over. Beef heifers - €500 to €885 over. Dry cows - €680 to €1,330 each. Another excellent show of stock at Raphoe Mart on Thursday, March 28. All cattle selling well as in previous weeks with a weaker trade for a bigger supply of light Friesian bulls resulting in these being more difficult to sell. All other stock remain a great trade including AAX and HEX cattle. Bullocks selling to a top of €880 over and heifers selling to a top of €885 over. Bulls sold from €1.70/kg to €2.70/kg. Bullocks sold from €1.90/kg to €2.70/kg. Heifers sold from €1.90/kg to €2.80/kg. Fat cows sold from €680/head to €1,330/head. Entries welcome for all pedigree beef bred. Females - cows, heifers and maidens.